Today marks the first year anniversary of the Glorietta 2 explosion that killed eleven people and injured more than a hundred. Glorietta is one of the numerous shopping malls in Makati City and is managed by Ayala Land, Inc. Police investigations say that a gas-buildup in the basement of Glorietta 2 was the cause of the explosion while Ayala insists that it was a terrorist act, though no terrorist has owned up to it (and Ayala would want that reason in order to avoid criminal liability). A year has passed since that tragic incident and it’s business as usual. Glorietta 2 still remains closed, but the explosion hasn’t deterred people from flocking to the mall and there’s been plenty of activities and expos that have been held at the Glorietta Activity Center at the heart of the mall. I remember going to the old Quad Commercial Center before, the first incarnation of the shopping complex that stood in this area before. You could see vestiges of that old Quad in Glorietta 2 before it was closed and the cinemas in Glorietta 1 are simply refurbished movie theaters of Quad. 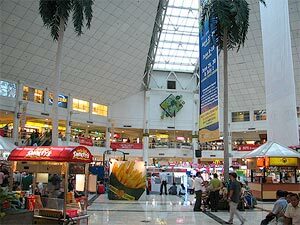 Glorietta was then constructed over the whole spot in the early 1990s and the Glorietta Activity Center is one of the largest indoor mall plazas in the Metro. Also, attached to Glorietta 4 are the two beautiful twin towers of the Ascott Serviced Apartments (formerly the Oakwood Premier) in which another incident took place in 2003, the Oakwood Mutiny. You might formulate a conspiracy theory or two, but Glorietta 2 has remained closed since the fateful explosion and coincidence or not, Ayala then pushed through with its plans to expand and upgrade this part of Ayala Center: Glorietta 1 and 2 will be upgraded to match Glorietta 3 and 4. In the past year, there have already been plenty of activity. The old Park Square 2 and transport terminal was demolished to pave way for a residential and Raffles Hotel complex. The open-air parking between The Landmark and Shangri-La Makati became an eight-storey car-park and shopping center called The Link. And Glorietta 5 BPO site and shopping building is now nearing completion, standing between Rustan’s and the Hotel Intercontinental Manila. I’ve heard as much from a high school classmate who works in Ayala Land, but you can read all about it from this INQUIRER.net article. If you want to read more news articles about the explosion, INQUIRER.net has an excellent micro news site dedicated to it.